There are over 6,000 species of reptiles and over 4,000 species of amphibians, varying in size from around an inch to several feet. The terrarium is without doubt the most important aspect of successful reptile and amphibian keeping. Many species have different requirements, so a versatile and easily adaptable terrarium is essential. 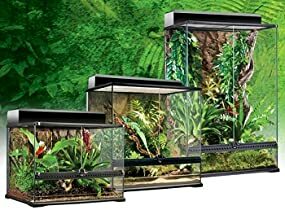 In order to meet the needs of the hobbyist and more importantly, the needs of reptiles and amphibians, Exo Terra developed a wide range of terrariums. All of these terrariums can be used for several applications and set-ups; from sterile housing to a state-of-the-art natural terrarium, from a desert terrarium to a tropical terrarium. Although very similar in shape and size as the “aquarium-type” tanks, these new versions have all the great features of the typical Exo Terra terrarium. The Exo Terra Natural Glass Terrarium is the ideal reptile or amphibian housing designed by European herpetologists. There are 12 different sizes of the Exo Terra Natural Glass Terrariums, all built with the same great features that help provide your reptile or amphibian with a durable and comfortable environment to live in. The front opening doors (single door on the Nano terrariums) allow easy access for maintenance and feeding. A specially designed lock will prevent escape and the doors can be opened separately. The full screen top ventilation allows UVB and infrared penetration, and is completely removable for easy access while decorating or cleaning. In the back of the screen cover are five closable wire or tube inlets on both sides to install Heat Wave Rocks, Waterfalls, sensors, etc. inside the terrarium. The bottom plate of the terrarium is raised to mount a substrate heater to heat a part of the extended ground surface. The extra high fixed front window is ideal for thick layers of substrates (burrowing reptiles), aquatic parts (paludarium) or to mount an Exo Terra reptile den. The natural background is in the same color like all other Exo Terra decoration items (Water Dishes, Waterfalls, Heat Wave Rocks, etc.) and provides an extra climbing dimension. The dual front opening doors (single door on Nanos) allow easy access for maintenance, misting and feeding. During terrarium maintenance, one door can be kept closed at all times; reducing the risk of escape by a swift reptile or feeder insect, and better retains the heat and humidity inside at the same time. Pivoting doors are far superior to sliding doors, as sand and other debris can jam the sliding doors. A reliable specially designed lock prevents unwanted opening from children or pets and is an extra security measure to keep the animals in the terrarium. The full screen top allows UVB and infrared penetration, and is completely removable for easy access while decorating or cleaning. Durable locks at the sides secure the screen top to the terrarium frame. The top has built-in closable inlets on both sides to securely run wires and tubing inside the terrarium and keeps small reptiles and feeder insects inside the terrarium. 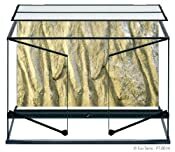 The extra high fixed front lower panel allows for deep layers of substrate, provides space for glass mounted decor like the Exo Terra Reptile Den or can be used to create a water feature as high as the ventilation strip. Every terrarium is tested for leaks. The bottom glass panel of the terrarium is raised to facilitate the mounting of a substrate heater or heat cable, and prevents heating accessory problems normally associated with standard “aquarium style” terrariums. It keeps the entire bottom panel well ventilated to ensure optimal hot and cold spots. The Exo Terra terrarium is deeper than the “Aquarium-type” tank, resulting in an extended ground surface. This gives the space needed for desert and ground dwelling reptiles and amphibians to thrive. The natural looking rock background is in the same color family as other Exo Terra accessories blending nicely for a natural looking habitat. The background provides an extra climbing dimension and endless terrarium design opportunities. The background also provides channels for running cords and tubing form the bottom to the top of the terrarium without being seen.